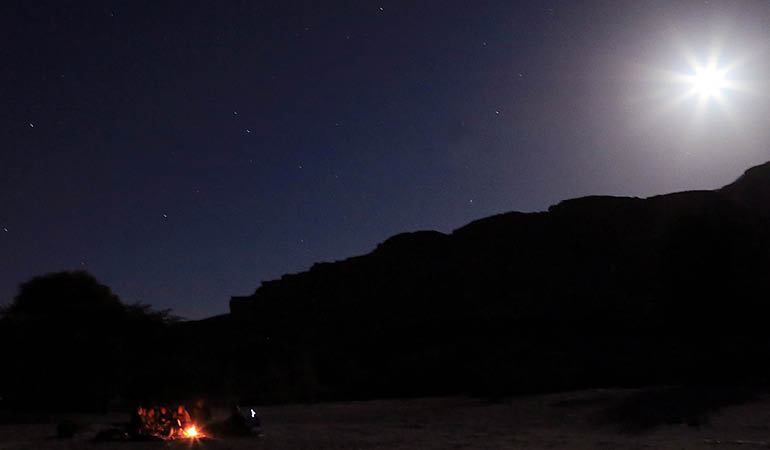 An astronomical adventure tour taking you to Egypt’s Sinai Desert, chosen for it’s pristine visibility ideal for stargazing. The open plateau is a great vantage point to observe the constellations and the Milky Way. 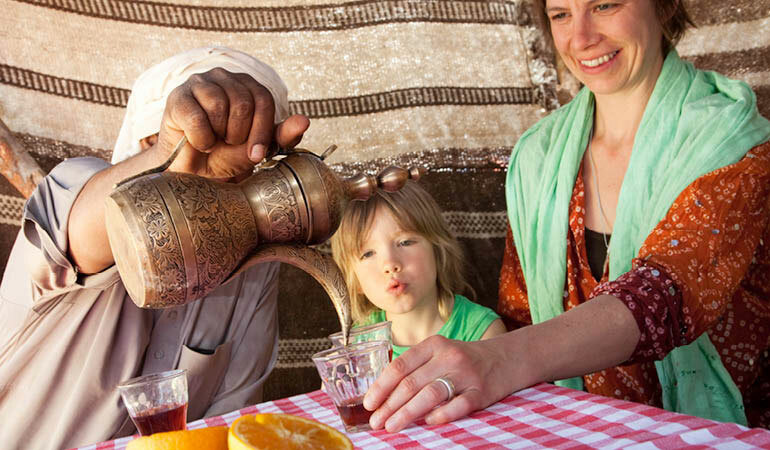 Immerse yourself in the Bedouin culture and experience their traditional nomadic way of life. Enjoy a sumptuous meal, using local seasonal ingredients, slowly cooked over the camp fire. Spend an evening of quiet contemplation sleeping under the stars and share stories around a crackling camp fire. 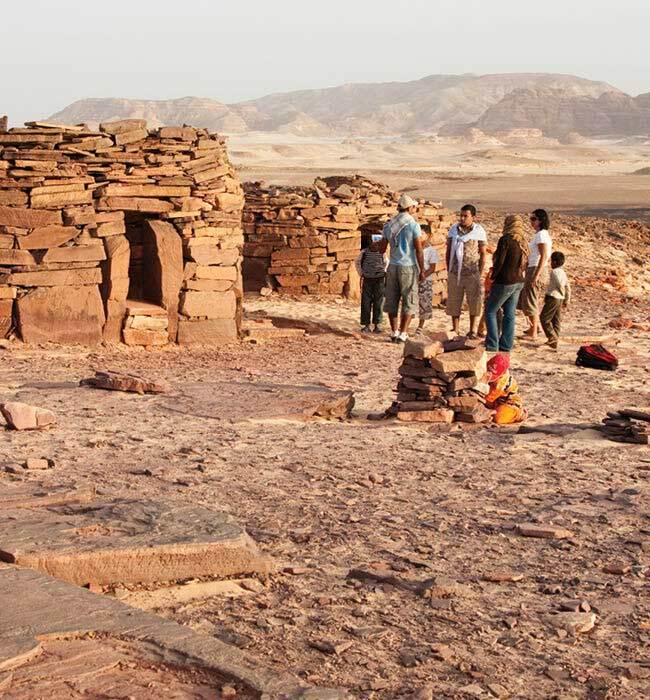 Contrasting the desert with Dahab’s energetic and colourful seafront, with a host of activities to enjoy, our Astro Sinai tour truly takes you off the tourist trail. Traditional Bedouin Camp | EMBAH’s nomadic desert camp in Sinai consists of traditional Bedouin tents, with carpeted areas for relaxing and sleeping. The Nomadic camp means that the camp will be set up and dismantled each day as you we move Mattresses are provided to ensure your comfort and sleeping bags can also be arranged. A kitchen area is set adjacent to the camp, where freshly prepared meals will be cooked on an open fire. Designated washing and toilet areas are set up and in some cases you can bathe in hot springs or fresh water oases. Our camp locations are picked for favorable weather conditions and stunning scenery. 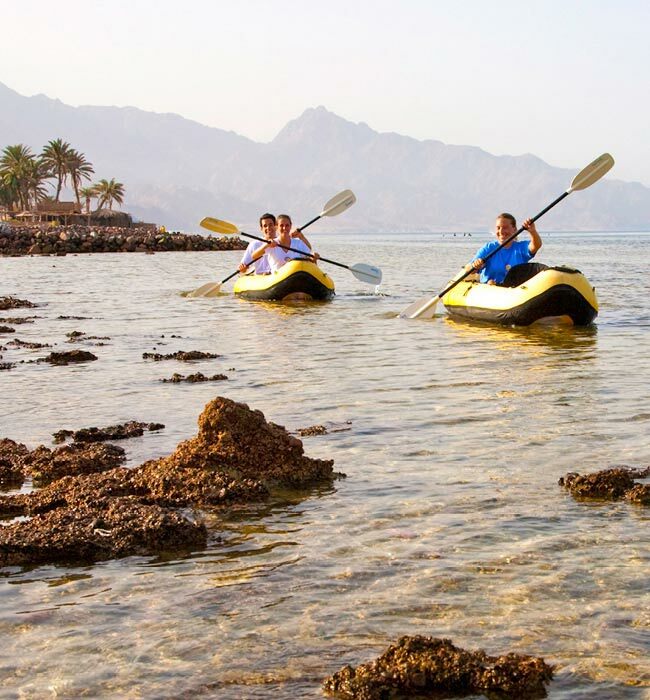 Coral Coast Hotel | Our recommended mid-range hotel in Dahab is the Coral Coast Hotel***. 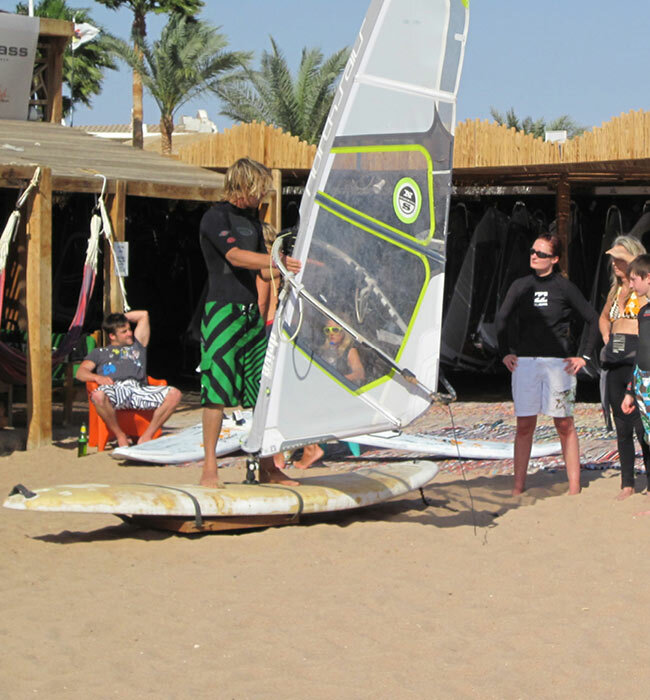 With 30 en-suite rooms, a private beach, restaurant and bar (all set on the shore of the famous dive site, El Garden) this idyllic location lies just a few minutes walk from the main bay area of Dahab. Rooms are simple and chic, and come equipped with air conditioning and a private balcony or terrace with wonderful sea views. The in-house dive center: Fantasy Red Sea, offers great dive courses and boating excursions, and the Coral Coast wellness concept boasts a host of on-site massage, yoga classes & therapies. Nawamis Desert School | An initiative developed by a UK charity that was brought about to enable the Bedouin villagers to remain in their desert homes and maintain their traditional way of life and still have their children educated. It also provides a special meeting place where Bedouin tribes can gather and celebrate. Medicinal and Aromatic Plant Gardens | a local initiative to preserve Rare medicinal plants unique to the region. Herbs gardens have been created on various plots in land throughout St Catherine’s and are also cultivated in greenhouses for preserving biodiversity, research and for sale. 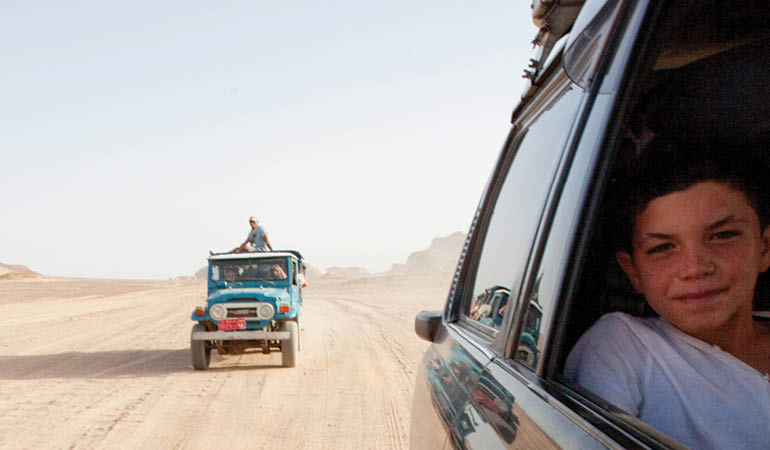 EMBAH tour leader & drivers, experienced desert guide & cameleers. 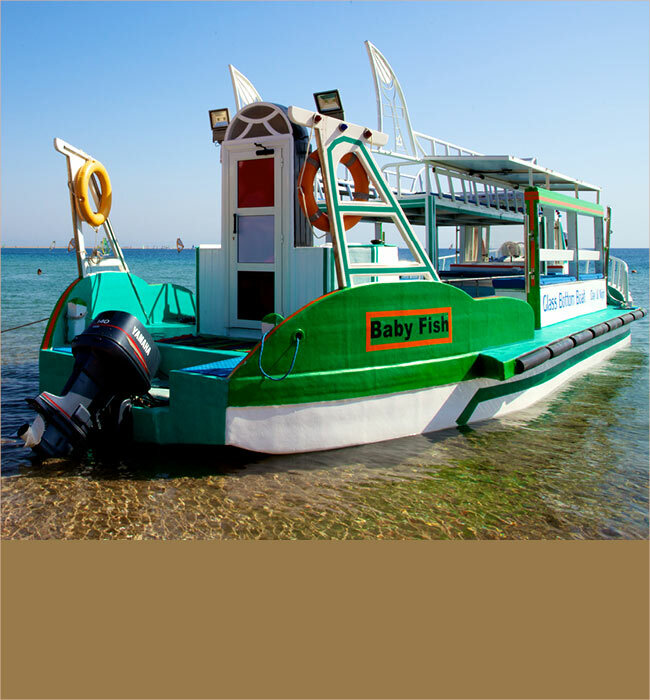 Our EMBAH Tour leader will welcome you at Sharm el Sheikh International airport and accompany you on the group transfer to Dahab (1hr) and check-in hotel. Group briefing with your Tour leader. Free time to explore the area. Overnight in hotel. Optional Dinner in local restaurant (extra charge). After breakfast join your 4x4 jeep transfer and set off to the desert into the Valley of the Frozen Dinosaur to see the rock formations with great photo opportunities. 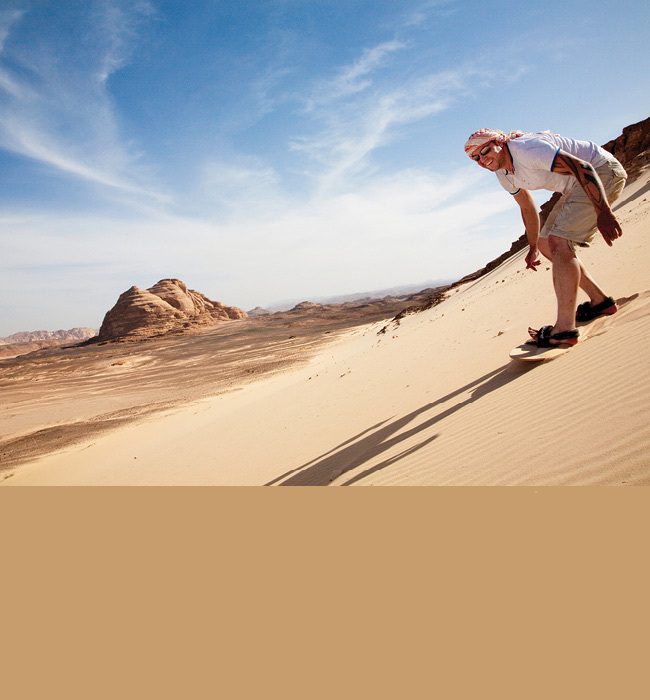 Continuing on to the largest sand dunes in Sinai at Haddoudah where you can try sandboarding (extra charge). Lunch on location. Transfer to our desert camp for the night at Matamir Plateau where you can get involved with the cooking of dinner on the open camp fire. Chance for stargazing after dinner and overnight camping. 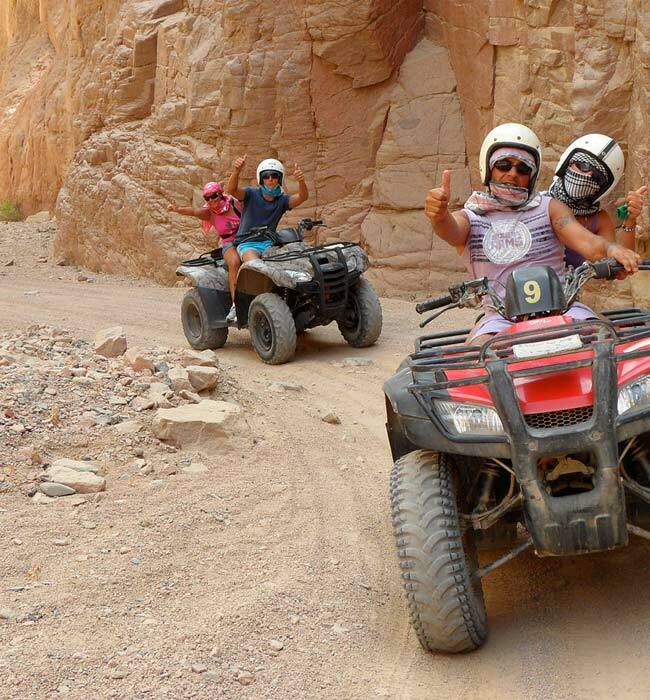 This morning you will go by 4x4 jeep to explore the White Canyon. 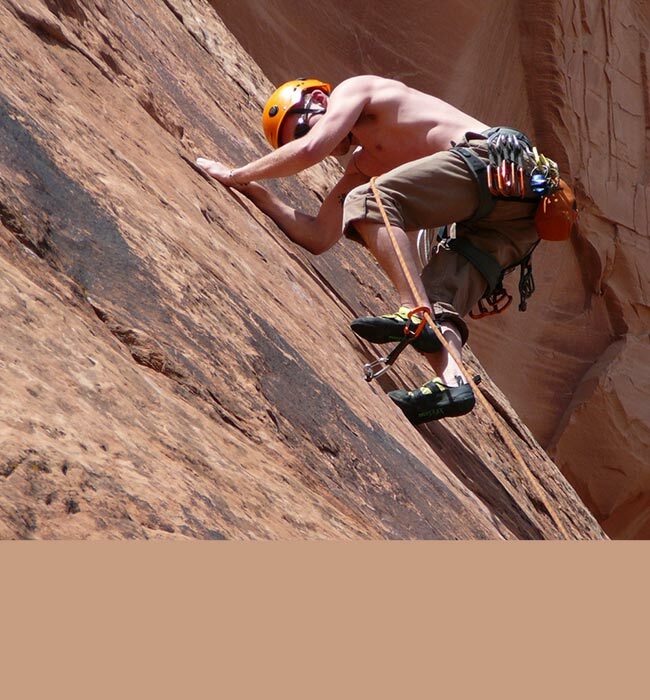 You will take a camel trek (1½hrs) to the top of the Canyon. We return with a 1½hr walk to the Oasis of Ein Khudra. Relax in the hot springs after having lunch in the oasis gardens. Camel trek back to Nabq to meet with the jeep for the drive back to Dahab. Option to stay in the mountains and enjoy a mountain dinner with stargazing (extra charge). Overnight in hotel in Dahab. Today you are free to relax around the hotel pool or book one our many excursions or activities. Option to visit the famous Blue Hole for snorkeling or try out an intro dive. Lasting approx 3hrs the session includes theory and briefing with an equipment overview and underwater session to a maximum depth of 12m. If you already dive then book a safari to one of the many spectacular dive sites or take a PADI course to improve your skills. Sunset quad biking in the mountains can also be an option for the afternoon. Overnight in hotel in Dahab. 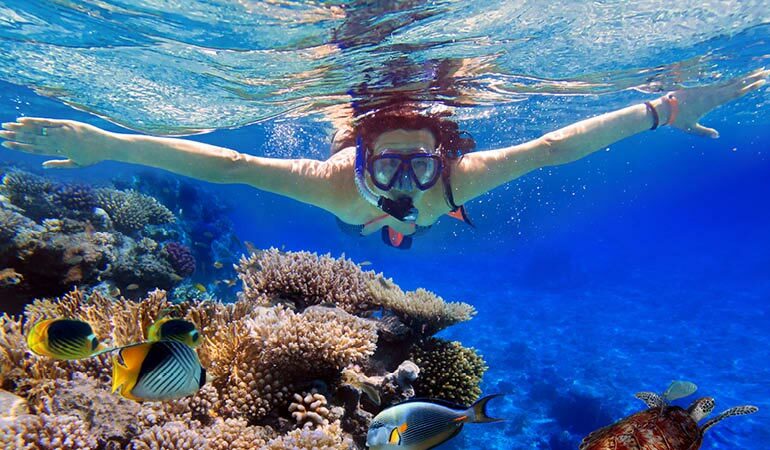 Full day to Southern Oasis in Dahab to snorkel in the crystal clear waters of the Red Sea, with some amazing coral reefs. Lunch on location. 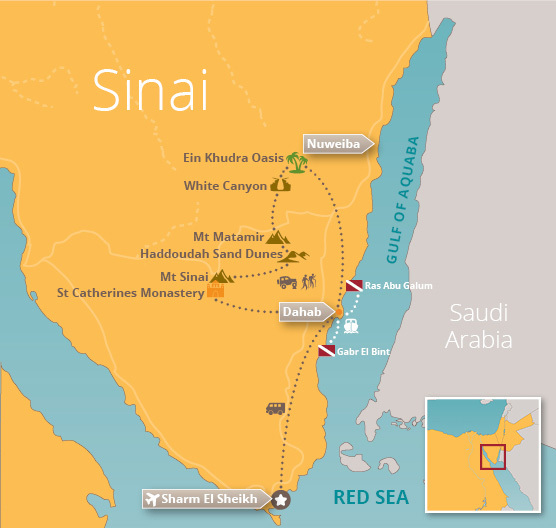 Optional evening trip to climb Mount Sinai for the spectacular sunrise over Sinai (extra charge). Today is a free day to enjoy your surroundings or take an optional trip. Glass bottom boat or Submarine can be an option to enjoy the underwater world if you don’t fancy to get wet (extra charge). 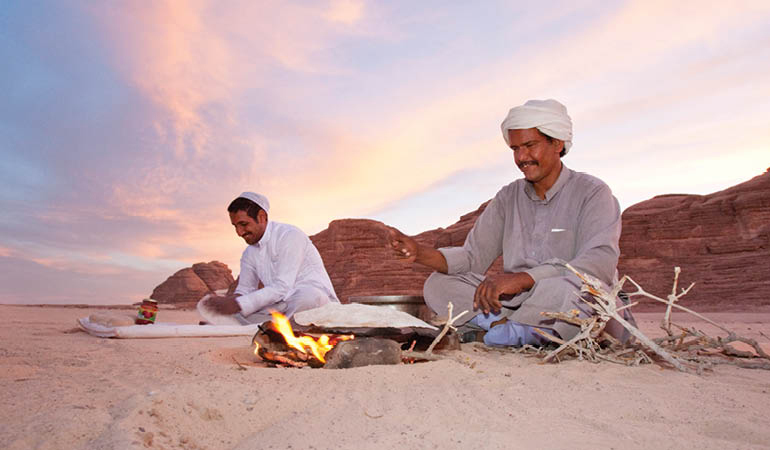 In the evening you will enjoy a traditional Bedouin dinner, cooked on an open fire, eating under the stars with a local family in the mountains. The tour ends today unless you have extended your stay. 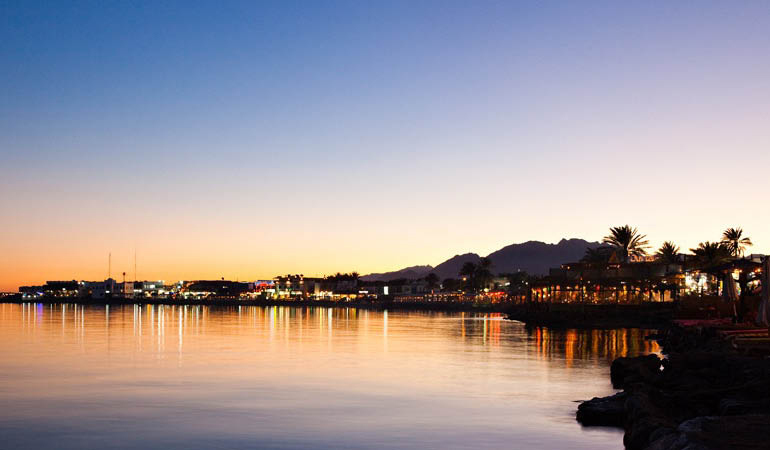 Your guide will arrange your transfer back to the airport in Sharm el Sheikh for your flights home.